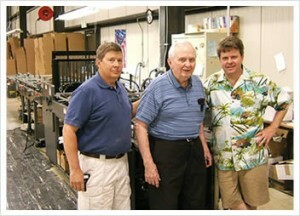 Pictured from left: Carl Schaefer Jr., President, Carl Schaefer Sr. and Dale Schaefer, Vice President, Art Bindery. Customer base: We service the entire printing industry as a trade finisher. We primarily work with printers and are looking at dealing more in packaging and the manufacture of custom substrates. Art Bindery was purchased by our dad, Carl Schaefer, Sr., in 1949 with money he saved from serving in the South Pacific during World War II. Dad is skilled in the old craft of book and library binding and worked the business hard during the 50s-70s. In the late 70s, after Carl and later I came into the business, we started to add new processes geared at serving the printing industry as trade finishers. Today we have 30 employees that work together to make Art Bindery a trade finishing service provider for the entire industry. Our key service points include: Various forms of laminating, spiral wire binding, transfer taping, blind embossing, foil stamping, diecutting and perfect binding. Our Kluge EHD Series Presses are capable of Foil Stamping, Embossing and Diecutting products up to a sheet size of 14 x 22. We use our EHD’s primarily for numbering, diecutting and foil stamping a wide range of product sizes, shapes and stock types. The sound solid construction of our presses enable flawless productivity. In an environment where deadlines are tight, a reliable machine is essential. 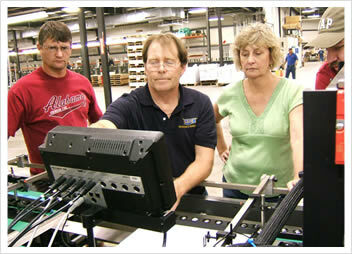 Kluge Field Service Technician, Wade Hamilton, demonstrates configuration of the OmniFold folder gluer system to operators at Art Bindery. The latest addition to our Kluge product line is the OmniFold automatic folder gluer. Presently, we use the OmniFold folder gluer for converting presentation folders. Due to the modular construction of the machine, the OmniFold folder gluer is very efficient at converting a wide range of presentation and packaging products. Because of this we have a lot of room for future growth in the converting and packaging portion of our business. Our sights are set on using the OmniFold folder gluer to expand into new and innovative forms of packaging. We have had a long relationship with Kluge and are excited with the purchase of the new OmniFold folder gluer which will give us more versatility in this market.